Students explored how objects and shapes can be described, measured and compared through dance and the Love Your Bean art installation. Students’ prior assumptions about how the world works was challenged as they as they discovered how their bodies could be used as tools for mathematical investigation. Students became more open-minded thinkers, who can express their mathematical understandings in a variety of ways. This projects opens borders on several levels, in particular it challenges the students’ prior understandings of how we measure objects and how we express mathematical facts and understandings. 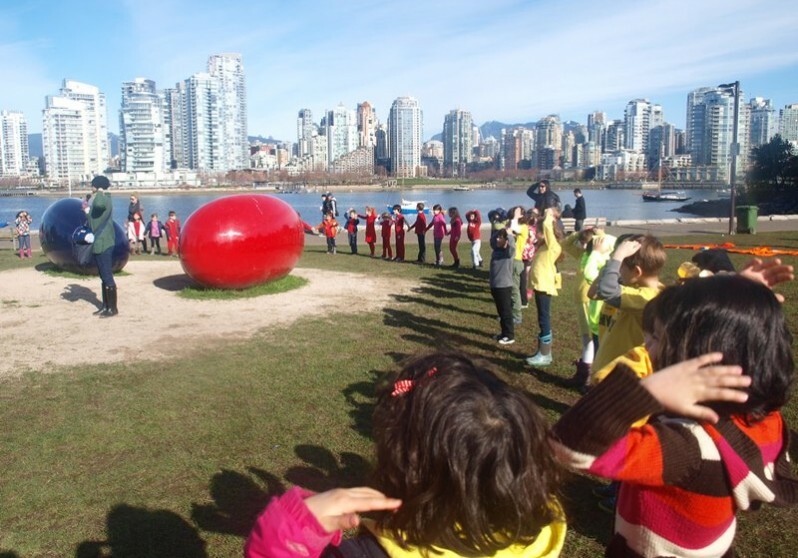 By choosing an exhibition in False Creek, the students of the school visit a community they are not familiar with. It gives them an opportunity to observe and compare the community to their own. The participation of two classroom opportunities as well as two different grade levels cross borders within school and build relationships. Understanding how the world works is a complex process that requires the use of all the senses and the recognition of different perspectives. 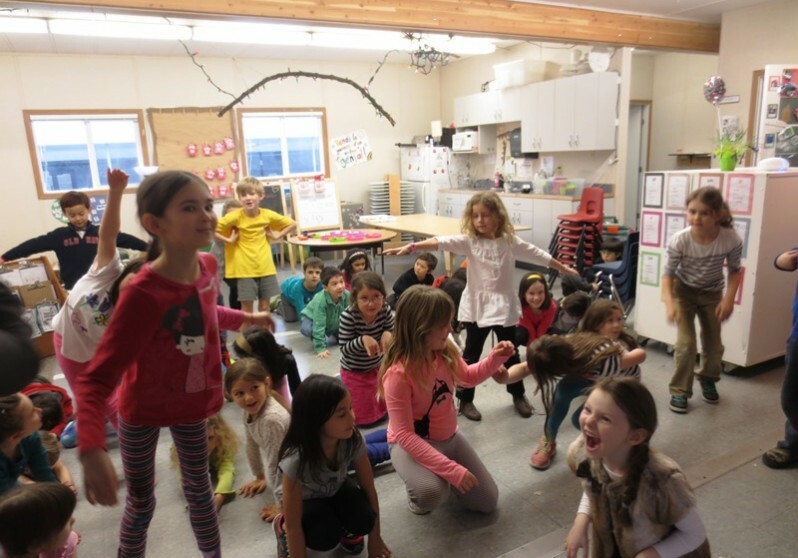 How can dance, as a means of discovering and expressing new mathematical knowledge, add depth to our students’ understandings of how the world works? How can our bodies and movements be used as non-standard tools for measurement? How can they help us to describe, measure and compare different objects? • Enjoying jelly beans: Using five senses to describe the jelly beans. • Exploring the properties of jelly beans… putting the jelly beans in different liquids, observing, recording and comparing data. 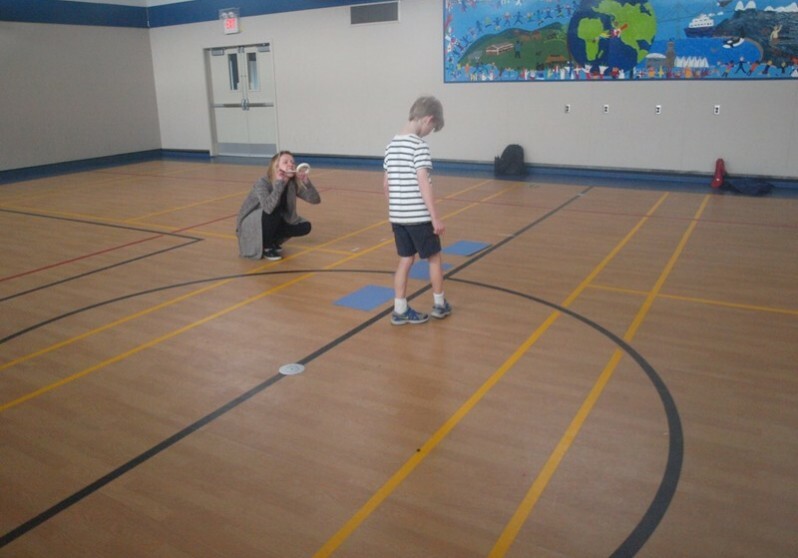 • Extending dance into mapping – how our bodies can be used to measure distance; create a map of the school. • Explore how community art projects like Love Your Bean influence the community. Look at different installations and discuss the emotions that are expressed, felt. Measuring Objects in Classroom: Students learn to measure a variety of objects using conventional tools and resources. Collect measurement data and record the different methods of measurement. Internal and external Observation: Students exposed to the importance of observation in storytelling. Students are challenged to recollect their classroom environment by closing their eyes. This prepares the students’ observation skills for the field trip. Unconventional Ways of Measurement: Students were encouraged to measure various aspects of the Beans including using hand-over-hand to measure the height of the Beans; using foot-over-foot and turning bodies on the Beans to measure the circumference, and how many hops and jumps from one Bean to the other. Observation: Being at this big open space, students practiced their observation skills in the surroundings of the park, the artwork and recorded their observations. The live sounds of the students at the Beans were recorded to accompany the choreography of the final dance performance. BIG IDEAS Anywhere educators: View the Love Your Beans Guided Tour Video and encourage students to explore at different angles individually and in groups. Reflection: The workshop after the field trip involved a lot of reflection and consolidation. Students were encouraged to create figurative and abstract movement to describe their observations and experiences for incorporation into the final choreography. 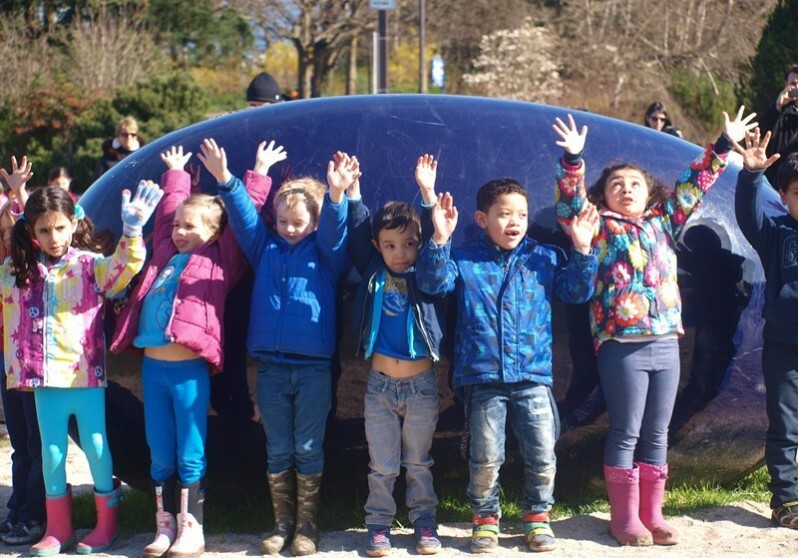 The students of the Kindergarten class, from their experience at the Beans, recalled sunshine, the openness of the park and the installation describing the process of cement making at Ocean Concrete at Granville Island. The students of Grade 1 and 2, did most of the measuring work. Some of their findings were – 62 times hand-over-hand to go around the Bean, 34 times foot-over-foot to go around the Bean, 8 times body revolution to go from the Yellow Bean to the Blue Bean. Aside from this, their experiences and observation during the field trip were captured. They were fascinated by the Seagulls, soft ocean and clouds at the site. Choreography: Drawing from the post field trip reflection and activity, the final choreography was co-created with inputs from the students, artist and the teachers. All the students were divided into three groups, representing the three Beans for final dance performance on site. During the final rehearsal day, the students used their findings to map out the Beans on their gym floor with masking tape. This activity encouraged creative and abstract thinking among the students. It was designed to allow students to move away from literal movement and expand their thinking and also getting into their bodies more to show and facilitate expression of the observations made. In this manner, the artist facilitated and co-created the choreography for the final dance performance. The artist also brought back the two rhythms from the first workshop to act a bridge between the other movements of the dance. On-Site Performance: Students were divided into three groups, representing three Beans. There a huge audience who cheered them on including passersby, parents of the students, teachers and the students of the False Creek Elementary School. 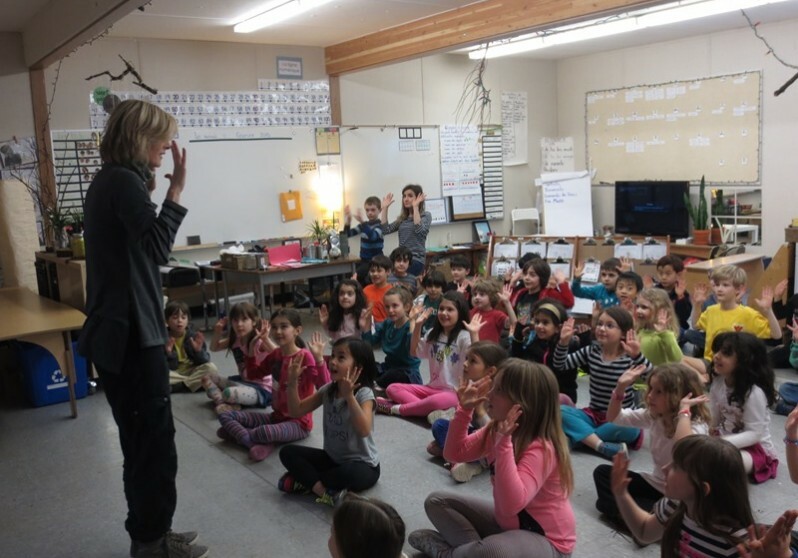 Early Feb (Pre-Field Trip) – The artist visited the school for the introductory workshop. The artist introduced the Vancouver Biennale and the importance of observation in dance. Exploring the Love your Beans exhibition with our artist Paula Skimin was a rich experience for all involved. 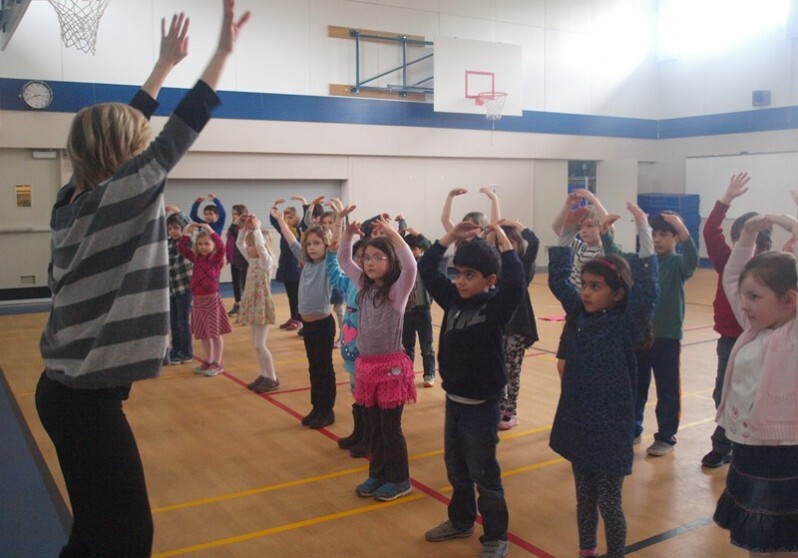 The integration of music, rhythm, and movement captivated and engaged students. For many, measuring the beans with their bodies and translating that measure into dance moves was an exciting way to share what they learned. It was wonderful to see how the students interpreted the world around the beans. 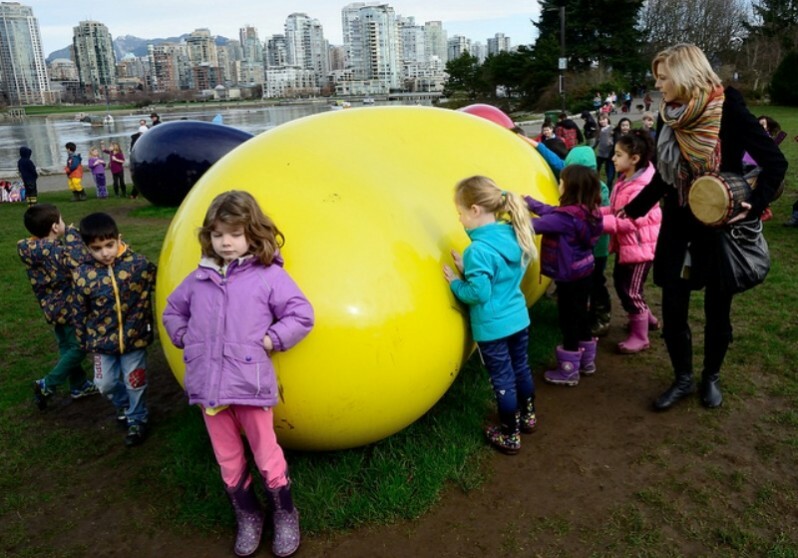 Traveling to Granville Island, exploring the Beans installation, using our senses, and dancing has become a new communication tool in our classrooms. Reflecting upon the experience, students named this activity as one of the most memorable of the term. Thank you for a wonderful cross-curricular and cross-border inquiry journey! The teachers at Cedardale were very receptive and excited about a collective endeavor between students, teacher and artist. The students were thrilled at the field trip and the exploration of beans. They were as vibrant as the beans with their enthusiasm for what they observed. They really loved measuring and touching the beans. The kindergarten classes enjoyed the bigness of the beans and their reflective properties. i.e seeing the clouds and the trees in the beans. The grade 1/2 classes loved the measuring element. It was interesting to see how the two grades reacted so differently . At the school the next day it was wonderful to hear the students reflections from the filed trip. They were very receptive when we developed movement created by their findings. They really loved the two rhythms that I gave them in Lesson 1 making them a good spring board for structure within the lessons. At the performance it was interesting to see some students really engaged, excited and motivated and others who had a hard time focusing with the introduction of an audience watching. I was happy that many of the students expressed throughout the lessons the importance of expressing movement figuratively instead of literally. Overall the students and teachers at Cedardale were very creative and motivated to express themselves through dance. It was a welcoming environment from lesson planning meeting to performance day at the installation.